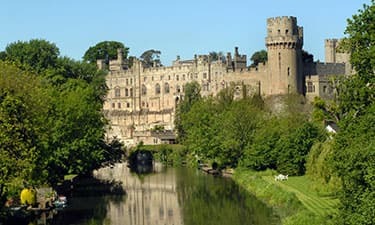 Warwick sits in the county town of Warwickshire on River Avon, just a short distance from Leamington Spa and South Coventry. Famous for its historic charm and majestic castle, it’s a popular destination for culture vultures and history fanatics alike. When you stay in one of our hotels in Warwick, you’ll have access to the best of both worlds, including an attractive blend of old and new attractions, as well as a busy calendar of events comprising literary, popular folk, and Victorian festivals. Book one of our Warwick hotels and discover all this area has to offer, including its most famous landmark – Warwick Castle. Located just three miles from our Regent hotel, it’s here you’ll be able to immerse yourself in myth, magic, draw-dropping history and adventure. Charlecote Park, situated six miles from our Stratford Upon Avon hotel, is also nearby. This National Trust attraction is home to an astounding Victorian property, surrounded by a picturesque deer park, making it the perfect place to visit come rain or shine. If you’re searching for the perfect family day out, Hatton Country World is a must-visit, as it’s here you’ll find an activity to suit all, including a farm park, country pub, camping site and shopping village. On top of the many scenic and architectural attractions, Warwick is also home to an array of cultural and sporting options. Warwickshire Museum is a great place to visit if you wish to learn more about this area’s thriving heritage and vivid past, it’s here you’ll be able to view an array of easily accessible specimens and artefacts. Another popular place to visit, especially if you’re staying in one of our hotels in Warwick, is Warwick Racecourse. Asides from the many sporting events, you’ll also discover beer, cider and music festivals, the renowned Ukulele Festival and the Thai festival.